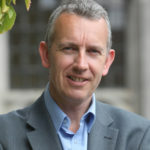 Brian McGuire is Professor of Clinical Psychology at NUI Galway (NUIG). A graduate of NUIG, he completed his professional training in clincal psychology and his PhD in Sydney. His clinical work in Australia focused on the rehabilitation of persons with chronic pain, acquired brain impairment, and those recovering from work and motor accidents. After leaving Australia, Brian was Consultant Clinical Psychologist in brain injury rehabilitation where he co-ordinated the clinical services of several in-patient rehabilitation units in the north of England. After returning to Ireland, Brian worked with Ability West learning disability service. He joined NUIG in 2003 and was the Director of the Doctor of Psychological Science programme in Clinical Psychology until 2014 when he took up his role as HRB Research Leader in Population Health. In addition, he is Director of the Doctor of Psychological Science for Qualified Clinicians and Joint Director of the Centre for Pain Research. Clinical health psychology and behavioural medicine, especially pain management and psychological treatment in chronic health problems. Brian’s current projects focus on (1) evidence-based reviews of therapy (2) epidemiological research (3) development and evaluation of psychological interventions for pain management, expecially internet-based therapy (4) chronic pain and cognitive impairment.